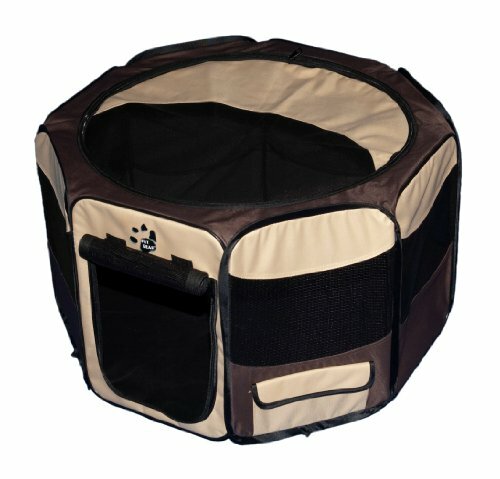 Pet Gear Octagon Pet Pen is a wonderful place for your small dog or cat. It is vented on all sides and the top can be left open or closed. The front door allows for easy access when opened. It is a great travel pen and easy to set up and take down for quick access! Made of 600 denier nylon. Ideal for pets up to 30-pounds. Set up a safe and convenient home-away-from-home in seconds, no assembly required! Folds completely flat for easy storage and portability; lightweight and great for traveling, camping and more! If you have any questions about this product by Pet Gear, contact us by completing and submitting the form below. If you are looking for a specif part number, please include it with your message. Paws & Pals 8-Panel Folding Wire Exercise Pen Fence Gate Playpen with Door for Dog Pets, 64 by 64 by 42"